We recently teamed up with the National Centre for Vocational Education Research (NCVER) to deliver another great initiative for the Longitudinal Survey of Australian Youth (LSAY), including developing an interactive parallax* website. Our brief was to engage 11,000, 20 to 24-year-old participants through an interactive and creative solution that could be supported by ‘pull’ promotional material that included a direct mail piece and HTML email. LSAY tracks young people over 10 significant years of their lives, from the ages of 15 to 24, as they move from school to work or further study. The survey collects information from the same young people each year. Social and wellbeing: volunteering, health, life satisfaction. 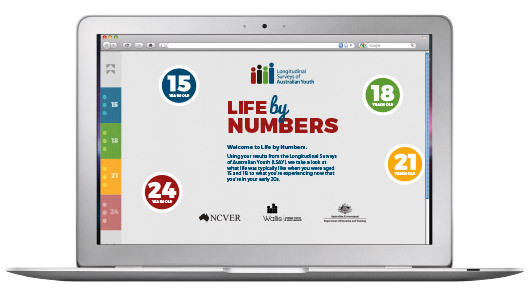 Our solution was to create an interactive parallax scrolling website called Life by Numbers. Drawing on data from previous surveys, the website creates a journey of life from ages 15 to 24 through the use of interactive graphics. It’s a great example of how this type of website can be used as a stand-alone marketing platform to engage with your audience in a fun and interesting way. Check out Life By Numbers! *Parallax scrolling is a technique in computer graphics and web design, where background images move past the camera slower than foreground images, creating an illusion of depth in a 2D scene and adding to the immersive feeling.